It’s that time of year when the leaves fall, crops ripen, and all the monsters come out. 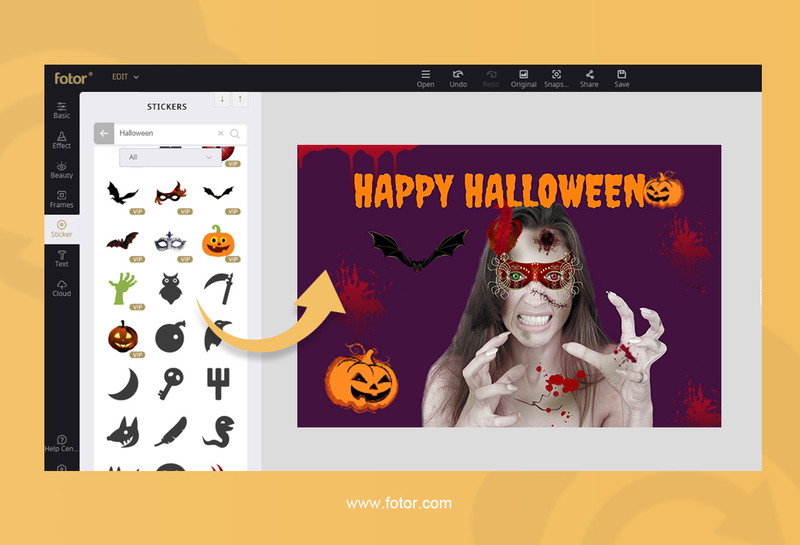 I doubt any of you out there are monsters, but Fotor can help you look like one with a few filters and stickers. 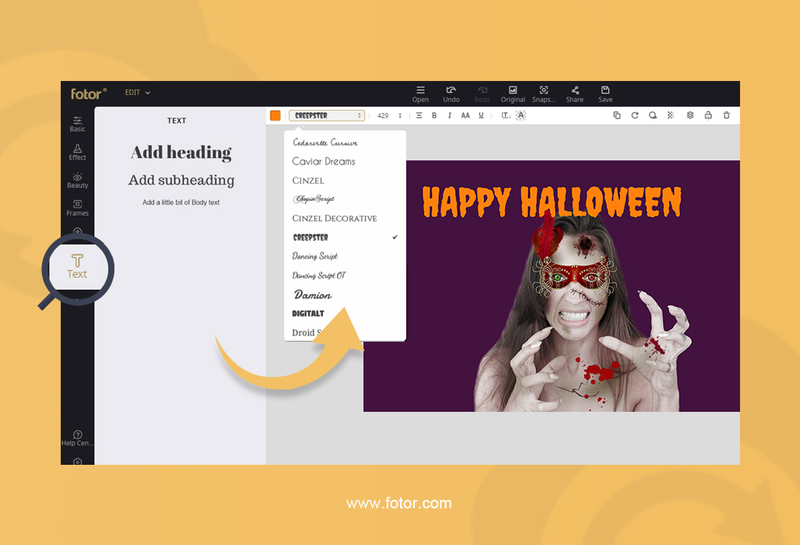 Whether your proclivities lean towards cute additions to your photos or you want to go straight horror, Fotor can help you make some photos that you can show everyone and celebrate this spooky time of the year. So, first let’s discuss what makes a photo spooky. Around this time, with all the different monsters running around at night, chances are you’re going to get hurt, either by the monsters or your environment while you’re running away from them, terrified for your life. So, that means some cuts, scrapes, or bruises are good. Also, since most of the spooky stuff happens at night, you should have a photo with a dark background. First, let’s take a photo, like this one. You can choose from your Computer, Dropbox, Facebook, or the Fotor Cloud. 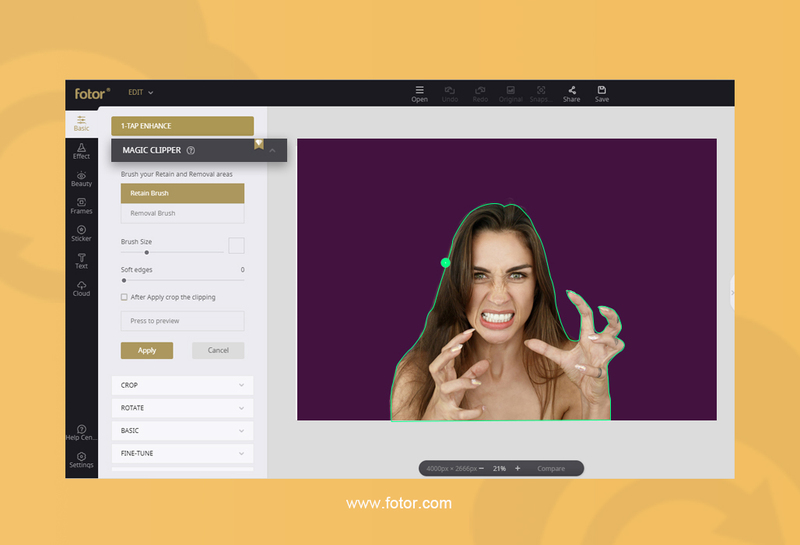 Fotor Cloud works just like you think it does. 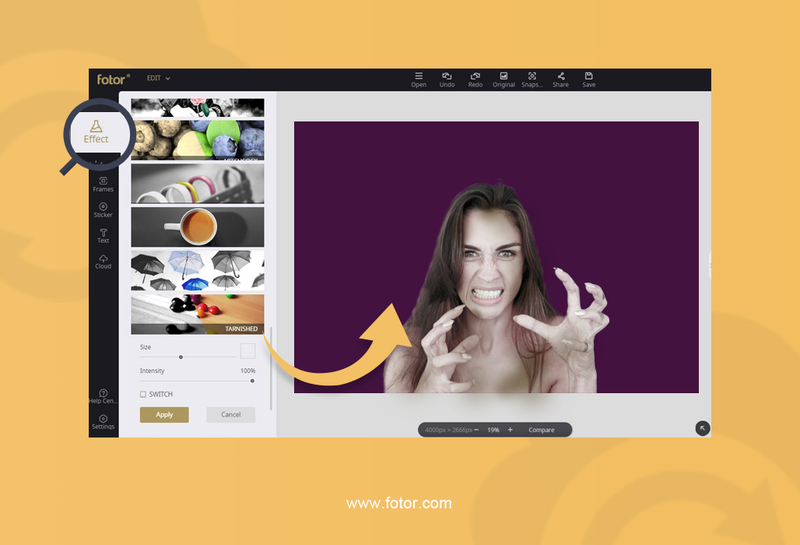 You can upload any photos or templates you’ve perfected to then share with others. Don’t worry! 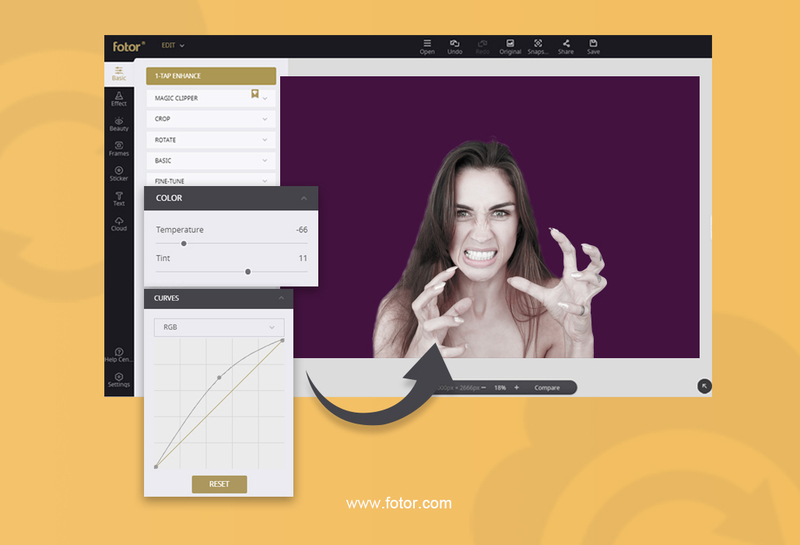 Once you reach your 5GB limit, you can then get a VIP Fotor membership and expand it to X GB. Now that my photo is uploaded, we can add some filters. Here I used the “MAGIC CLIPPER” tool, which helped me separate the background from the image of the woman. No matter what your interpretation of a zombie is, they consistently lose appendages while they shamble around the vast apocalyptic wasteland they reside in. You can hold down the “Press to preview” to see what your clipping will do. Here, I reduced the temperature and added a bit of tint because zombies are dead, so they’re skin won’t be full of life. I also took out some color like so because I really wanted to accentuate the whites in the skin to give it a more dead look. White signifies blood is no longer circulating near the skin, which happens when you become a zombie. Next, I used “TARNISHED” under “Effect” and the subcategory “COLOR SPLASH”. I tried to be as uneven as possible, accentuating some areas and missing some areas to make her skin seem blotched, which happens when you get really sick, and since some zombification comes from sicknesses, I thought it was a nice touch. Here’s where I went a little crazy with the stickers. As you can see, these are VIP stickers, and having VIP Fotor affords you some great stickers to really make your picture pop. I also played with their transparency to make it feel more real, but, let’s be honest, this is more as a fun process to liven up your Facebook profile pick or avatar pic somewhere else, so have some fun with the stickers! I decided my zombie came from a classy masquerade ball and still had her mask when she was turned. Then I added some blood around the mouth and hands to show she had gotten a few survivors at some point, or maybe feasted on some BRRRAAAAIIINNNSSSS. This zombie is bugging out here! So, I gave her some bugging out eyes. You can make it sit below the mask with the “Layers” right here at the top. I took a few more stickers and added some text to make it look really festive! As you can see here, the orange color’s hex code is#ff810c, and the font I used is called “CREEPSTER”. TA-DAAAA!!!! 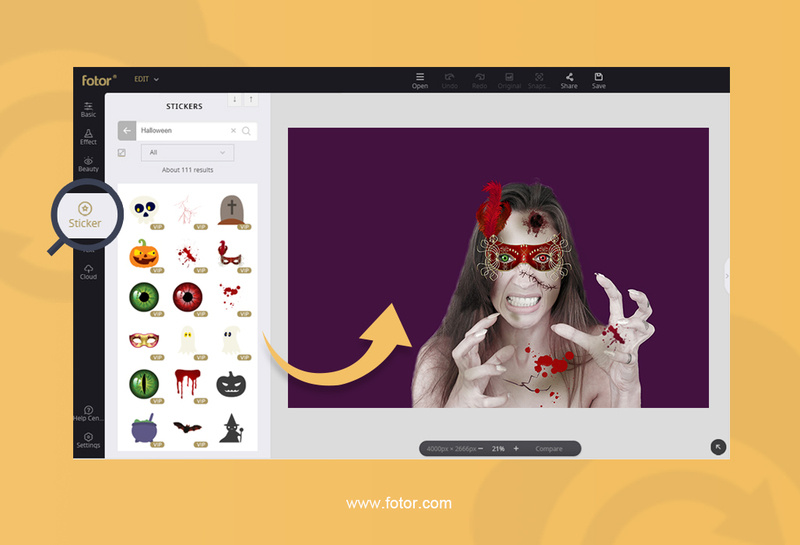 It’s easy with Fotor to make a Spooktacular Halloween avatar by just applying a few filters and stickers. Wasn’t that easy? Join us next time where we will help you announce your party or event in Spooktacular fashion or give your clients a spooky coupon that will terrify them with the savings they’ll get!